Barakamon is one of those stories where an artist struggling with a block moves to the countryside to rediscover what he is lacking. 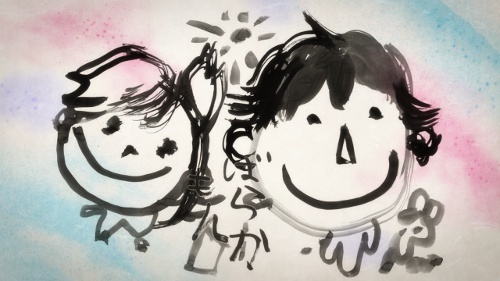 Unlike the majority of those stories, however, Barakamon was an excellent show, its vision executed in a way that was both funny and sincere. I think the secret here was how Handa, the main character, was someone everyone with an ounce of creativity could relate to. Handa is grumpy, impatient, neurotic, with a confidence that waxes and wanes at the worst possible times. But he is also resourceful, focused, and hardworking. He is the artist in his best and worst. Naru, Handa’s foil, is a little more special than your garden-variety brat. It’s not just the child voice actor, though that certainly helps, but Naru feels like a real child. All too often the innocent layperson who helps the artist in his journey to rediscover himself is barely a character and more of a sounding board to help the artist trigger his Eureka moment. But in the show, it’s Naru that takes the lead, being more than anyone could handle. She does not dole out epiphanies; they lay scattered in her wake as she goes off running to her next adventures. After all, the Avatar of Play is supposed to play. Something needs to be said about Handa’s countryside adventures. This is the inaka, where people don’t have any locks on their doors and there is only one phone in the neighborhood and everyone knows each other. On principle I distrust the popular notion of moving to a quieter place so that you could practice a creative pursuit more freely–application of one’s self to art is reliant on the person himself, for how could cityfolk produce art, then? 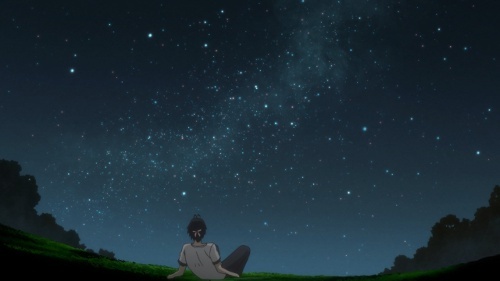 But Barakamon follows through its conceit well, with a town that’s both warm and nurturing, though in its own ways. It doesn’t coddle Handa for one, who is often overwhelmed with the differences between city and country. Perhaps my favorite part in the show is when Handa, walking home at night, falls off a cliff (! ), and becomes lost in the woods. He is tired, alone, and about to give up, until he realizes that he’s been at the back of his house all along. Then he looks up the sky, and sees the starlit sky. Which leads to his best work yet, later that night. PS: The Ryo of NoisyCell is not the same ryo of supercell. It’s okay, I assumed the same thing. This entry was posted in 12 Days, Anime and tagged barakamon. Bookmark the permalink.